Wow - how things have changed in just a few years! As you all probably guessed, all of us Olympic photographers have short deadlines. When I first shot the Olympics, my contract allowed me 12 hours to go through the photos and get them back to the team. When I photographed the Summer Olympics in London, my deadline was shortened to 2 hours. That means that I would have to go through thousands of photos, pick the best, edit them and submit them to the team within a couple of hours. Now, with the ever increasing immediacy of the Internet age, They want me posting images at each break. So that means that, when the buzzer sounds at the end of the first period of hockey, I have 14 minutes to download my photos (I shoot full RAW), go through them, edit, resize them and upload to Team USA. And I need to do this so that I am ready to start shooting again at the start of the next period. No pressure! This is my simple setup for on-ice editing. I have one or two cameras (usually with a 70-200 and a fish eye lens). Today, I shot with the 70-200 and used a Pocketwizard, which is hanging off the glass, to fire a remote camera behind the far goal. So...how do I do this? First of all, I am using the fastest memory cards, fastest card readers, and fastest computer I can get. All of these pieces are critical in my workflow. For the cards, I am using the new Lexar Professional 1066x CompactFlash cards, and I am writing to two of them at the same time in each of the Canon 1DX cameras (for redundancy). I am also using the newer Lexar Professional USB 3.0 readers so that I can download the images to my laptop as fast as possible. My laptop is the Apple MacBook Pro Retina, which has an SSD instead of a traditional hard drive, and this thing is fast. For software, I use a program called Photo Mechanic (which almost all of us use here at the Games) because it is wicked fast and let's me caption and FTP the files from one program. This is the setup in my "hotel" room. There I am using a Wacom Cintiq Companion Hybrid tablet for fine tuning images. I am also using Western Digital Passport Ultra drives to backup in 3 different locations. * Photo Mechanic comes up asking for a folder name to download to and asks for IPTC info. * I enter the IPTC data (something like "USA vs Canada (Women) Hockey"
* I mark the best with a color rating, so that I can filter for just those. * I go through all the photos from that period and then filter to show only the winners. * I quickly go into Photoshop to tweak each of the best (exposure, contrast, crop...) and save the file appended with "Edit_"
* After I have done this to the best, I need to caption them with the names of the athletes. For this I have created a document called a replacement code file with every player on Team USA, men and women. I can type in "/26w/" and Photo Mechanic will insert "USA Hockey's KENDALL COYNE (#26)"
* Before sending the photos off to the team or the wire service, I have a preset in Photo Mechanic to resize the photo, and all the FTP info is pre-stored. One touch of the button and off they go. * I then eject the card from the reader, pop it back in the camera and start shooting the next period. Usually, by the time the game is over and I am finished with everything, the images have already been posted on the USA Hockey Olympic page and the wire service. Oh - and somewhere in between each of the events, I sit down to write a blog. Oh - and for those of you who have not done so, you can put your email address in the field above, so that you will be notified any time a new blog has been posted. Just curious - your remote camera - aren't you concerned about it still being there when you go to retrieve it? Approximately how many "Winners" are you sending a period? And yes I would still want to do this. The workflow isn't scary because it sounds like you have a great workflow in place. That's what I call pressure!! What happens if you run into network issues and can't send the images right away? Is there a plan 'B'. Or the plan 'B' is - NO IMAGE FOR YOU!? Jeff, I love the Olympics. I love photography. This has been the most interesting Olympics, because of your blog. We spent a good chunk of the hockey game today looking for you behind the glass. Although, my wife made me admit that I don't actually "know you" - ha ha. Keep up the great work. I recall you described that process for the past Olympic Games (London and Vancouver) in some videos from B&H, and it already sounded a tough job! Now, with everything explained so in detail and knowing how long those minutes in between the games are (honestly, when you're at the hockey game you barely have time to go to the WC, buy a beer and go back to your seat!) it sounds on the border line with impossible! Thank you so much for finding the time and energy to share your experience with us live! And about your question: probably I simply couldn't make it because of lack of talent and professionalism, so no swap of roles, but I would really love to be there and see everything from behind the scene! Thanks for this blog post. I found it very informative. I am shopping for a new Macbook. Is the link you posted in this article, the Macbook you use? Holy cow man!! Thats totally insane deadlines, but I can understand why they need copy so quickly.... with mahooosive file sizes you really do need to work quick. Is PM that much quicker than LR? Fascinating! Sounds crazy hectic, but I'd take it right now if offered. You're doing a great job!!! Wow amazing work! I just retired from the service I was a photojournalist in the Navy and would like to know, How do I start? I would LOVE to try this Jeff. I'm enjoying all of your posts from behind the scenes. Keep up the great work! And the Olympic Gold goes to Jeff Cable for sports photographer speed editing! I would love to actually watch you go through this process. Editing is the worst/slowest part of the process for me. Jeff...RESPECT!!!!! The answer to to your question...I would!!! I've managed almost identical gear you mentioned. I've shot a few festivals with lightning fast deadlines, but nothing of this sort. RESPECT JEFF RESPECT!!!! I'd still be up to shooting a game. I struggle with a 24 hr. deadline sometimes. Like most things done very well by very few, it's not as easy as it looks. Thanks for your insight. Like most things done very well by very few, it's not as easy as it looks. Thanks for the insight. Great article Jeff, Thank You very much. I am a photographer, and actually do want to do this. Reading this confirms some things for me, and also makes me reconsider Photo Mechanic. You're doing great work in Sochi, keep it up! And please stop and enjoy it, you're a lucky man. And hard working too, hah! Just wondering, why don't you use a wireless transmitter to send the files to your laptop while you are shooting? Great stuff, Jeff - thanks! Even for those of us not shooting on quite that tight a deadline, most of the ideas translate to Lightroom. I love the keyword substitution thing -- I wish I had something like that for LR. Your blog is both interesting and informative. Off to buy some new hardware. Thank you. Jeff, you are truly a master of your craft! You inspire me to learn, especially after seeing all your Olympic photos. Thanks for the inspiration! Wow! Thanks for all the information you give out! This sounds like an awful lot of work and hustle! Have fun! Love your work and blog. Seems it would be so much easier to have someone editing your photos trackside while you just shoot. Of course I am sure space is extremely limited, but oh life would be so much easier. Actually you could probably have them sitting in the stands with a laptop and a wireless receiver using a transmitter to send them the images directly from your camera. Jeff, you are truly a master of your craft! You inspire me to learn more, especially after seeing all these wonderful Olympic photos. Thanks for sharing your experience!! Seems it would be so much easier to have someone editing your photos trackside while you just shoot. Of course I am sure space is extremely limited, but oh life would be so much easier. Actually you could probably have them sitting in the stands with a laptop and a wireless receiver using a transmitter to send them the images directly from your camera. They could edit and forward the images while you are getting the best shots. Jeff, you are truly a master of your craft! You have inspired me to learn more about photography - I love shooting at night as well. Thank you for sharing your experiences and for being such a great inspiration! After reading that I want to be an Olympic photographer even more so. This blog just helps even more as preparation. I reach my goals and this one of the them. Thanks for the inspiration. I'd still love to shoot a game. great advice on workflow. I hear photo mechanic is the sports shooters must have. Great work, love you shots. No way sounds to much like hard work. PS great blog loving every one. It's the most fun you'll have for a job. It's the most fun you'll have doing a job. It would be a blast to assist you. Actually I'd love to see the documentary that chronicals the behind the scenes of an Olympic Team Photog. Maybe they'll make Olympic Photography an Olympic sport! Wow, that stresses me out just reading it. Great work...we sure appreciate it! I think I would need a lot of practice before I could be that efficient. What percent of the images you capture each period are uploaded to the teams between periods? Jeff, this is insane, this is Jim B from Meridian. A good eye for detail and your vast experience on what qualities you want in a picture has helped you to meet some incredible deadlines. The hockey team could not have found a better representative to take pictures. I hope you have a wonderful time there, be safe and keep blogging. See you when you get back. Hell yea. I want to be one of the guys who people are envious of the workflow, you, chase...the amount of work and passion is incredible. Me! Sounds very hectic, but thrilling! Me! It's sounds hectic, but thrilling! Me! It sounds hectic, but thrilling! i do!!! i would love the opportunity!!... BTW Jeff you have a truly impressive workflow. Mr Jeff .... that's wicked !!! It just shows how well you manage the profession of art and unreasonable deadlines. Love your work !!! Amazing. Never really thought about it, but man, that's impressive! Nice post. Jeff - Thanks so much for sharing not just the images, not just the emotion and what was happening but your experience. I love the techie stuff and eat it up. That said - you are a machine to get through this workflow and post. We ever meet I want to buy you a beer! Thanks again for sharing and be safe. I'm in awe, Jeff... you're a machine!! Keep up the great work. Wow, thanks, that was awesome! I am Dana Arnold's best friend, she suggested your blog, knowing I have 1000s of files to edit after shooting a high school game (hobby) and just managing THAT is a huge challenge (I have a paid full-time job). I use Aperture, not LR but will look into PM or at least into some way of labeling each photo by athlete. How exciting to be you...I am certain your career falls into the "I love my job" category and you do it so masterfully. Awesome info Jeff. Thanks for sharing. I love the pressure-I freelance for a daily paper my methods are a almost like yours (FTP-Photo Mechanics)-but I certainly have a much slower pace-still gotta love what you do! "Now, after reading that, how many of you still want to try this? :)"
Thanks for all the great posts and pictures! Thank you for sharing all the behind the scenes stuff... and your pictures are great too. I'm exhausted just reading what you do. Sounds like you have a workflow that works well for you. Thanks for sharing your process, makes me appreciate your pictures even more. I wondered how you were getting all your photos in on deadline and still finding time for blogging. Thanks for sharing all of this! Thank you for kindness! You're such a blessing! I started shooting sports on deadline this fall and ended up with almost the same workflow. I shoot a lot of college volleyball and have to select images and transmit at the break between sets two and three. After reading the comments I thought I would add a few personal experiences. 1. PhotoMechanic is a must have for this. Lighting fast and available Mac or Windows. Builds thumbnails faster than anything I have seen and the metadata tools are first class. 2. If you are more of a Lightoom user you can set up a similar workflow and use Lightroom as your editor. I have presets set up to help with the tweaking. I use PM to do my selections and metadata and the dump just the picks into Lightroom for editing and cropping. 3. With fast memory cards, the new Lexar USB 3.0 card readers are screaming fast. Sounds like you've got a pretty sweet workflow already in place, but I'm curious why you don't shoot with a wireless card or adapter so that as you're shooting - the images are downloading to your computer. Perhaps there is so much wireless interference it just wouldn't be reliable - or you have no way of being close enough for the wireless to work? Another question - what about "picking" as you shoot? Again - probably no time to pick on the fly - but I've heard about NFL photographers who star images in-camera and wirelessly send just the picked images in live time for wire. Great post as always Jeff! 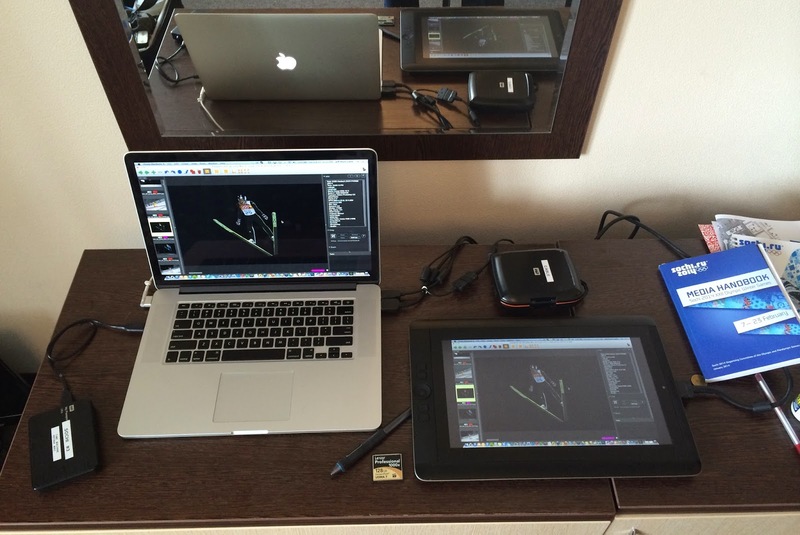 It is very interesting to follow your work at the olympics and to see your gear and workflow! Hey Jeff, you asked about the multiples,, they are creative, the more you shot the better---welllllll you get it,, I liked them,, fun stuff,, lot of work Eh???? but looks like you are having a blast..Best Luck on return home.. I am a new fan of yours, and have so enjoyed your posts and really love your behind-the-scenes posts, as well as your extraordinary pictures! It's a fun way to follow the games. Thank you! I haven't read all the comments but saw a comment about why the pictures need to be uploaded so quickly. I am not even close to the level these guys are at shooting the Olympics but do shoot the odd high profile music event on the very small island I live in. Even for these gigs it is essential to get photos up on social media ASAP to build interest and interactivity as this window of interest itself is so short. Not many people care about an event 24 hours later or it has been surpassed by a newer event that is holding their interest. Consumers today expect things instantly and for websites to capture the consumer interest they have to meet these demands as best they can. I hear so many times that a photogs job is getting easier with better technology and longer frame bursts but a photogs job isn't done when he finishes clicking the shutter. Higher demands are putting more pressure on photogs delivering these shots. What size do you resize before you submit your shots? Interesting article. Wouldn't you save quite a lot of time by continuously send your raws from your MBP through Wifi? I know the Canon 6D does that natively, and you can probably get a Wifi extension for your 1D as well. This was an awesome breakdown of workflow! I have some experience with live sports deadlines shooting for my college, but I can't imagine the pressure (and the satisfaction that you must get at the end of the day) doing photography for the Olympics. My solution was to carry a net-book with SSD and tethered to my phone internet so that I could dump a card, tweak a few great ones, and upload them to wherever they must go in minutes. All while still on the turf in the thick of battle. What a thrill. Any particular reason you're using Photoshop instead of lightroom for your basic tweeks? I feel like in the interest of speed, LR would be a better option, especially for things like WB, crop, contrast, etc. No pressure. Would I want to do this? No thank you. I enjoy my photography, this is not. But, looks like you've got it down to a science. I know the feeling, I've had to tether my Macbook Pro to my iPhone 3G while in remote locations, and upload as fast as the connection will allow.. Good old technology eh! Great post, I really enjoyed having a chance to get a peek into the incredible world of fast-paced professional sports photography! Just curious how many images you are averaging per period? I know everyone is asking a lot of questions but would love to compare to what I might shoot in a period.